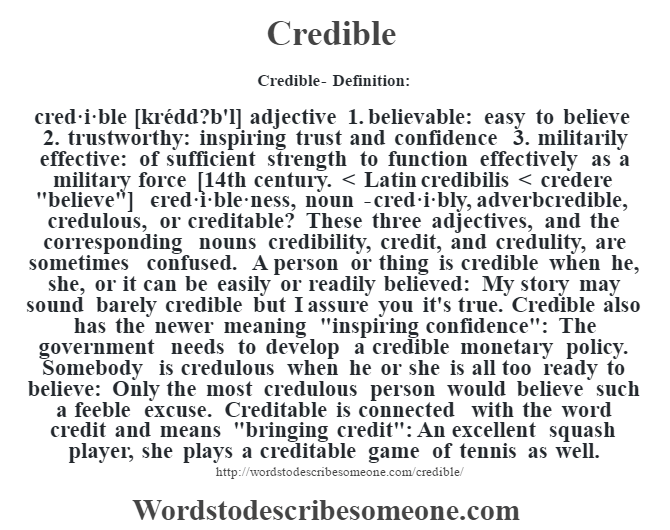 cred·i·ble [krédd?b’l] adjective 1. believable: easy to believe 2. trustworthy: inspiring trust and confidence 3. militarily effective: of sufficient strength to function effectively as a military force [14th century. < Latin credibilis < credere "believe"] -cred·i·ble·ness, noun -cred·i·bly, adverbcredible, credulous, or creditable? These three adjectives, and the corresponding nouns credibility, credit, and credulity, are sometimes confused. A person or thing is credible when he, she, or it can be easily or readily believed: My story may sound barely credible but I assure you it's true. Credible also has the newer meaning "inspiring confidence": The government needs to develop a credible monetary policy. Somebody is credulous when he or she is all too ready to believe: Only the most credulous person would believe such a feeble excuse. Creditable is connected with the word credit and means "bringing credit": An excellent squash player, she plays a creditable game of tennis as well.